Gantt Charts is a very convenient means of planning work with a project. For the first time (at least, as the History record goes) this type of diagrams was applied by an American engineer Henry Gantt (1861-1919) in 1917 for planning of building ships in the First World War times. So, what is Gantt Chart? This is a chart that displays tasks as time bars positioned along a horizontal timescale and a one that indicates to project milestones with the help of indicators. Evident advantages of the chart are its visual clearness and at the same time its information density. You can add or change information right in the chart and see the result at once. Gantt Chart proved to be such a powerful analytical instrument that it had not undergone any changes for almost 100 years. It was only in 90s of the last century when link lines between tasks were added to the Chart. 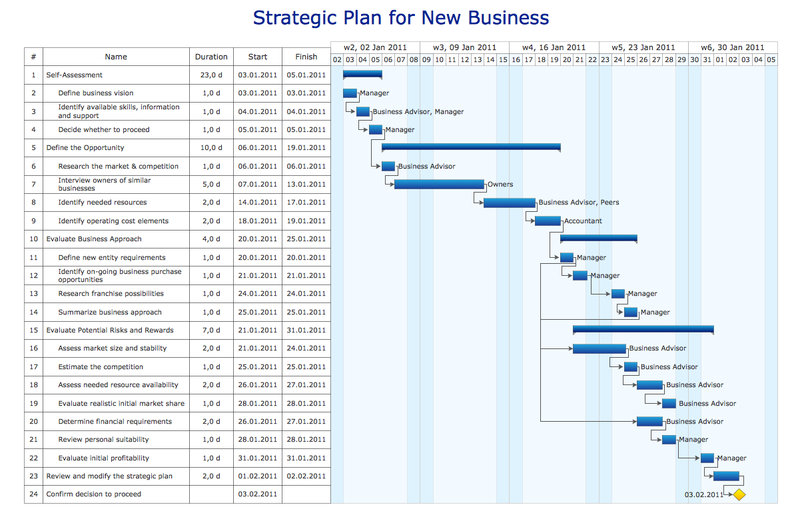 All Gantt charts were made using ConceptDraw DIAGRAM v12 JECT. ConceptDraw DIAGRAM v12 JECT works both on Windows and Mac OS X. It allows to schedule a voluntary number of projects in a single Workspace document and lets easily share tasks and resources among them. ConceptDraw DIAGRAM v12 JECT shares files among Windows and Mac OS X. Separated into categories of Basic, Intermediate, and Advanced categories, the new instructional videos about ConceptDraw DIAGRAM v12 JECT cover a huge breadth of topics. Users new to ConceptDraw DIAGRAM v12 JECT will find the Basic lessons an essential platform for familiarizing themselves with the programs′s functions. This video lesson is the first in Basic lessons series. Picture: What Constitutes a Project? ConceptDraw DIAGRAM v12 JECT has flexible print settings that allowing you to easily print your project data to suite any need.